An eyeglass prescription is for the purchase of eyeglasses only. It does not contain certain information that is crucial to a contact lens prescription and that can be obtained only during a contact lens consultation and fitting. Your eyeglass prescription contains information regarding the lens power required to correct your vision problems. It consists of spherical power, cylindrical power, cylinder axis, bifocal addition, and prism power. 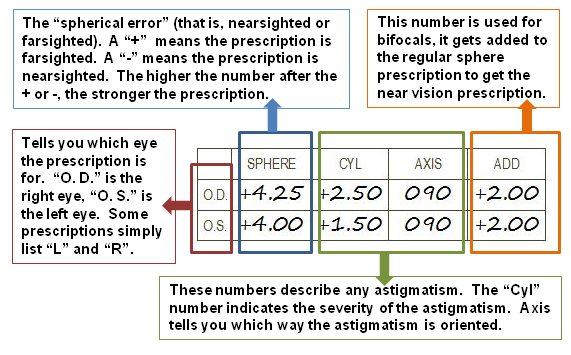 Your prescription will contain only those numbers that are pertinent for your vision correction, for example if you do not have astigmatism, you would not have a cylindrical power and axis information in your prescription. Most prescriptions do not contain prism power. The two most important of these mystery terms and abbreviations are OD and OS. These are Latin terms that mean OD – (Oculus Dextrus) right eye and OS – (Oculus Sinister) left eye. This is the main part of your prescription. This number denotes the strength of the lens as measured in diopters. A diopter is a unit of measurement that is simply the inverse of the focal distance of the lens as measured in meters. For example, if a lens has strength of 2 diopters, then parallel light rays that pass through this lens will focus together at a distance of 1/2 meter (50 cm) away from the lens. The PD or Pupillary Distance is the distance between your two eyes , center to center, the center of one pupil to the center of the other, in Millimeters. Some prescriptions have two numbers, written such as PD 65/62 usually written on a bi-focal prescription. This means that 65 is your distance vision PD, and the one to be entered on our forms. And 62 is the reading or near vision PD, the one to be used only if you are ordering a plain reading glass only. The optician will measure the precise inter-pupillary distance (PD) to ensure accurate placement of lenses in the frame.